Proper initial analysis of structural damage to a house following a fire can help prevent unpleasant surprises later on. Thousands of gallons of water used to extinguish a fire can cause extensive damage to the structural components of a house if these components are not allowed to dry properly. Although it is important for the house to have proper ventilation in order to promote drying after fire suppression, any holes in the roof should be covered as soon as possible to prevent rain from entering the house, thereby prolonging the drying process. Often tarpaulins are sufficient for this task. Wood framing members, such as trusses, wall studs, rafters and joists, would likely not be damaged during short-term exposure to water but could be damaged if they are exposed to water over an extended period of time. This becomes a possibility if the house is left open to the elements following a fire or if wet carpet or wet debris from the fire is allowed to stay on the floors of the house. Wet debris is very heavy and should not be collected in piles on the floors of the house because this could lead to deflections of the floor joists and beams which increase the expenses during repairs. In order to prevent water damage that could show up after the new interior finishes have been applied, it is wise to replace all roof sheathing and floor sheathing that has been in contact with trapped water for an extended period of time. On the roof, the asphalt shingles and underlayment should be removed near any edges that were exposed to water in order to allow the sheathing to dry. During this period of drying, care must be taken to protect the roof sheathing from rain by tenting the exposed areas with tarps. 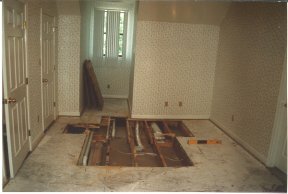 Underfloor insulation often traps water and should be removed as soon as possible to reduce the possibility of warping the floor joists. Gypsum wallboards and wall insulation should be removed expeditiously in order to allow the wall framing to dry. Ceiling boards and insulation should be handled in a like manner. After the wet sheathing and wallboards have been removed and the structure given time to dry out, the floor and wall framing need to be checked for slope. For floors, the use of a simple level and string line can detect overall slopes as well as individual members that are out of line with the rest of the floor joists. Sloped or warped floor supports can be shimmed or planed after they have dried. The moisture content of structural members can be checked with a moisture meter if needed. Similar methods can be used to check wall studs for straightness before applying new wallboards and molding. Checking wood timbers before repairs are begun should eliminate any future surprises and expenses. Steel supports in the house, such as beams, columns, flitch plates and brick lintels, should be checked for fire damage. If the geometry of the steel member has changed, its load carrying capacity has been changed also and should be checked by a licensed engineer. Steel members that are encased should be uncovered to insure that standing water is not present. Allowing the steel to dry will prevent corrosion that would weaken the steel member. 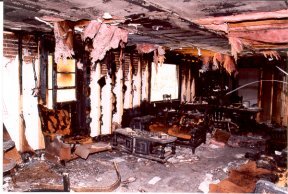 Summit Engineering can assist you with fire damage assessments and reconstruction plans. Please contact Neil R. Baer, P.E. for additional information.